I participated in the Japan Exchange and Teaching Program as an Assistant Language Teacher (ALT) from 2009 to 2013. I taught English primarily in two high schools for two years each. 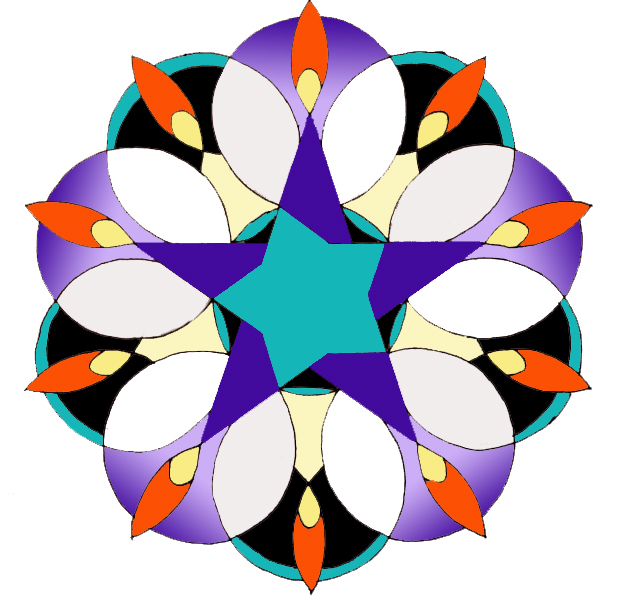 At my first school, I created lessons with two different co-ALT’s, while at my second school, I designed lessons either entirely on my own, or with input from the Japanese Teachers of English. At both schools, regardless of who wrote the lesson plan, the classes themselves were executed team-teaching style. One of my goals in lesson planning was to inject a healthy dose of art and creativity into the lessons I was in charge of creating for the various classes, which ranged from Oral Communication (basically English conversation classes) to Debate to after-school sessions with my two high schools’ English clubs. One lesson I was particularly fond of was making mythology mini-books, which I talk about in detail in this blog post. 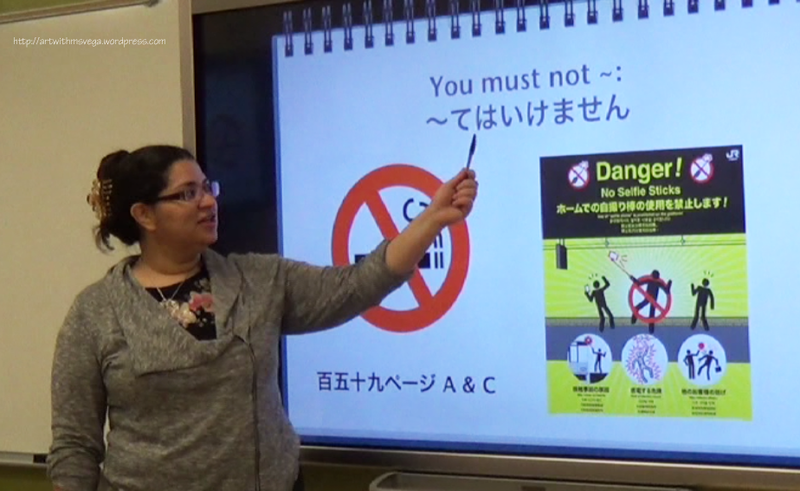 From a video taken my first term teaching Japanese. When I applied to JET, one of my personal goals for life in Japan was to become good enough at Japanese to teach it. Thanks to my second Bachelor’s in Asian Studies, I had enough language ability to make my way mostly on my own from the moment I arrived in my new home in Fukuoka Prefecture. I continued studying independently and in a volunteer-run class, and by my last year there, I passed Level N1 of the Japanese Language Proficiency Test, the highest level of said test. After returning to the States, I mostly worked as a freelance translator until January 2017, when I began working as part-time faculty at Wayne State while finishing up my Master’s in Art Education at the same institution. My first term, I taught two sections of Elementary Japanese II. I was given an old syllabus to work from. Although the “what” of the classes was already set by the curriculum, I had freedom to invent the “how” in delivering the content to students. 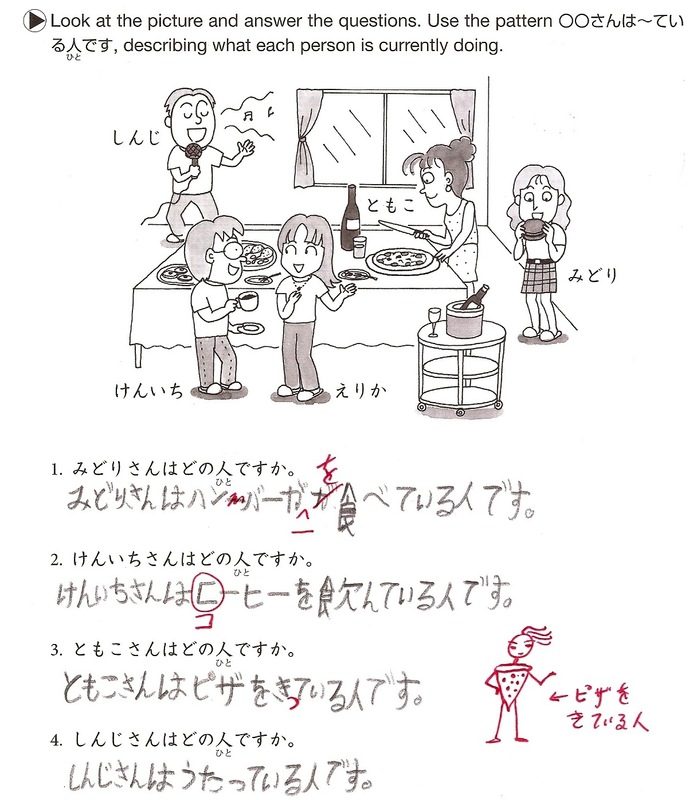 I used the GENKI Teacher’s Manual as a starting point in designing lessons, and now that I’ve taught this class to three sections in two semesters, I’m confident that what I present to my current section (in the Winter 2018 term) is the best work I’ve done so far. The five circles below contain but a small sample of the materials I’ve created for use in class. Everything except for the slides for one of the sessions covering Lesson 8 is from the Winter 2018 term. In general, we cover three to four grammar points in one class session. Exercises are done as a class, in pairs, and in small groups. Students answer orally but are encouraged to write their answers down, either before or after presenting them. Every fifth class or so we have skits which incorporate everything students have learned so far. I tell students to be creative and let themselves write crazy things. It doesn’t matter if they’re having tea with Godzilla so long as they put the particles in the right place! In any subject, it’s crucial to give students feedback in a clear and timely manner. Doubly so when teaching a language that uses a completely different writing system and whose grammar structure is often the reverse of most students’ native English. I give thorough feedback both in class, on paper assignments, and on online assignments. 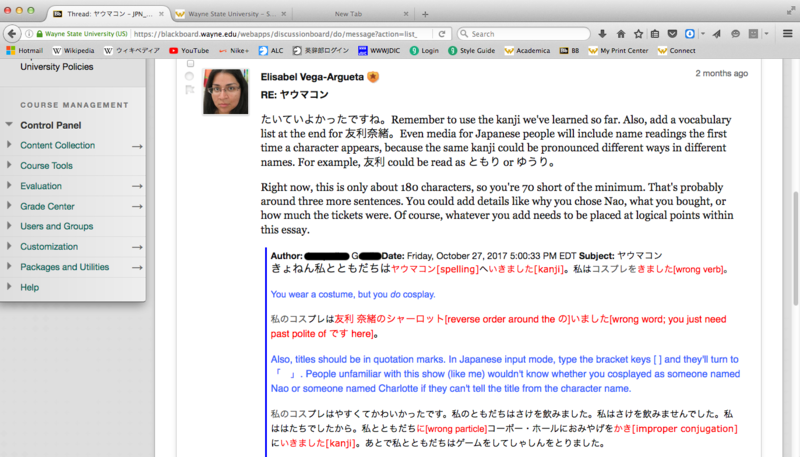 My arts background makes me a better Japanese teacher because I can explain both writing (the shape of characters) and grammar (differences in meaning between structures/conjugations) using visual language which does not cause the sort of conflicts that explaining one language’s words with another language’s words can cause. A word might be an adjective in one language and a noun in another, but it will always be the same when represented visually. Just as Japanese students confuse letters that look similar (all the circles-with-sticks letters—b, d, p, and q), American students need extra help differentiating ツ、ソ、シ、ン、and ノ. 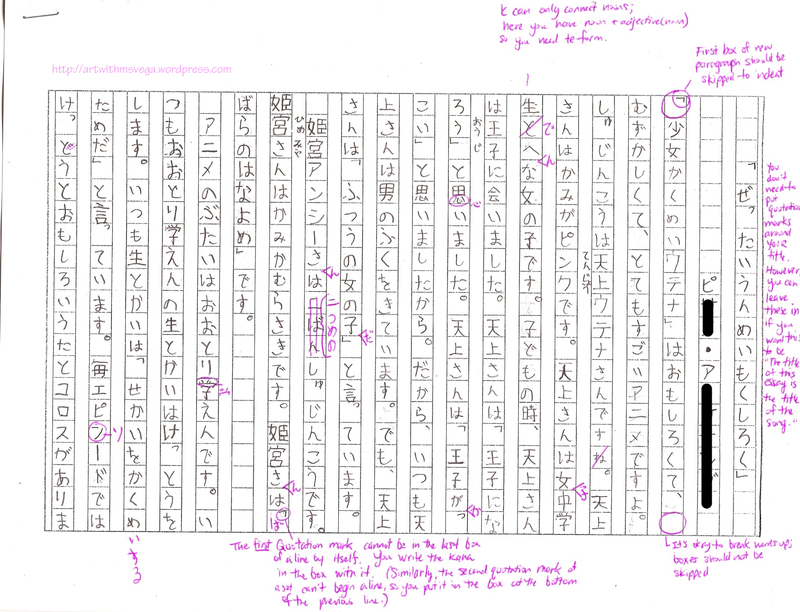 In this case, a student consistently wrote the characters ソ and ン incorrectly on their workbook homework. Conjugation can change things drastically! This student meant to write, “Tomoko is the person cutting the pizza,” but instead wrote “Tomoko is the person wearing the pizza.” I couldn’t help but illustrate the difference! I make use of color-coding when correcting online submissions and assignments as well. Within the body of a student’s text, I highlight errors in red, make comments in blue, and sometimes add corrections in green. I avoid the latter as much as possible, as I prefer to have students try to correct their own work at least once; they learn more from trying to figure things out themselves than they do from being told what the answer is. An example of how I check the Mini Essays, short writing assignments done entirely on the Blackboard Discussion Boards. Sometimes, I use this “spoiler cover” trick to give students a chance to correct their own work without having to wait for me to come online again to see if they did so correctly or not. For the final composition, students must write on genkouyoshi, Japanese composition paper. As simply learning how to write on this paper—vertically at that—can be a challenge, I scaffold the task by giving students the option of using one of the Mini Essays they had done on Blackboard as the basis for this much longer work. I get very few chances to express myself in Japanese beyond speaking to the Japanese language teachers I work with at Wayne State. In class I have to limit myself mostly to the vocabulary and grammar students are supposed to know, and communications with friends in Japan tend to be written, thus not nearly as spontaneous as spoken conversations. I did have one interesting chance to participate, in a way, in an English class after I had returned to the States. One of my former co-workers from the first high school I taught at requested videos from multilingual people on the topic of whether or not speaking another language gave them another personality, and asked that participants speak in as many languages as they knew. Here is my answer on that topic. Despite the lack of opportunities to speak in Japanese, I do my best to keep my more advanced language skills from getting rusty by regularly listening to Japanese music, watching Japanese movies and dramas, and reading Japanese novels. I also drive an American-made Japanese car whom I speak to in Japanese. (Ahaha!) I went back to visit Japan for two weeks in 2016 and hope to make another trip soon after completing my Master’s.